Confine-orm (aka CONFINE Object REST Mapper or CONFINE Object Resource Mapper) is a high level Python library for easily interacting with CONFINE REST API using object oriented concepts. The main goal of this library is to provide fast and easy access to CONFINE REST API: Open a Python interpreter and start interacting right away. To achieve this goal we have borrowed some ideas from traditional SQL object relational mappers and applied them to an hypermedia-driven resource-oriented architecture (CONFINE). This library has been heavily inspired by Django’s ORM implementation; also using an Active Record like pattern, plus concurrency based on asynchronous non-blocking I/O and caching based on Identity Mapping. Confine-orm leverages the HATEOAS discoverability of CONFINE’s API; rather than relying on a predefined knowledge, resources and methods are autodiscovered on the fly, while browsing the API. The following diagram illustrates the classes used to model CONFINE REST API and how they relate to each other. Api is a good starting point for browsing. It represents the Base resource of an API and it has links to Manager and Action. These relations are discovered from the Link header of the HTTP response. Manager is used for accessing linked Collections and Resources. Actions are used to represent action-like endpoints (i.e. do-get-auth-token). Actions are special methods that are not expressed using HTTP verbs (POST, GET, etc). Collection is a list of uniform resources; all resources share the same media type (i.e. all registered nodes). For convinience it maintains a link back to its manager in order to proxy its methods. Resource is a local representation of a remote resource (i.e. a node), basically a Resource is an object with a URI. It may contain nested resources, or RelatedCollections. RelatedCollection is a subcollection that all its resources are related to the same parent (i.e. all slivers of a particular node). 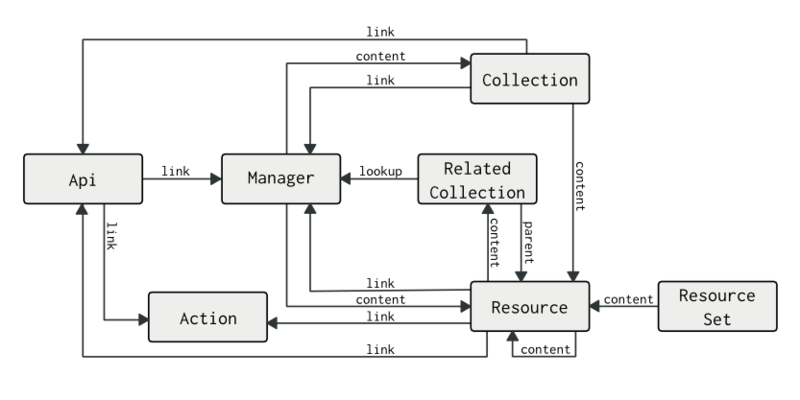 A RelatedCollection is able to construct a lookup for discovering its related Manager, therefore it is able to proxy its methods. ResourceSet is a set container that can be used to perform concurrent operations over a set of non-uniform resources. 403 FORBIDDEN (!= 200, 201, 202) Authentication credentials were not provided. © Copyright 2013, Marc Aymerich. Revision 8d6d89a4fa8bf2bf2e300c0599021c5576b0527f.